On October 20 Valencia FC and KAA Gent met at the legendary Mestalla. It was only the second Champions League game in the Belgian team’s history and for most likely everyone first ever away match in Spain (last one a decade back). A week later the entire city unites in protest against the actions of Spanish police. Official complaint letter was signed by executives and fans of KAA Gent, but also by Ghent mayor and vice-chief of police! This show of solidarity is probably top of the list why we decided to share this story. The letter produces a long list of accusations against officers of Policia Nacional in Valencia. 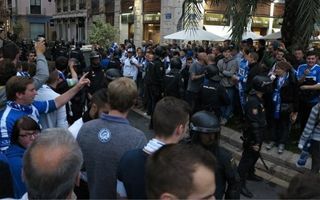 These include provocative behavior, lack of any dialogue, unprovoked intimidation and violence, seemingly random ejections from the stadium, forcing fans to stand in rain despite having available shelter, denying supporters access to toilets for a long period of time and more. Shocking? As the letter suggests, it’s indeed shocking to the Belgian visitors, though their protest also seems extremely unlikely to change things for future contingents of foreign supporters. After all, disturbingly similar accounts of police brutality were raised by followers/officials of the English national team (2004), Bolton Wanderers and Olympique Marseille (2008), Charlton and Manchester City (2012). And these are only a couple of examples that popped up first in the search engine, there’s much more to look into. Which is exactly what UEFA should have done a long time ago. The governing body is among institutions to which the complaint was filed, now it’s their time to finally do something about the extremely poor matchday strategies (or lack thereof) used during games in Spain.